Laughter drifts out the front of the dental office as I step inside. Rounding the corner, I can see the source of all the hilarity, Reginald C. Jones, seated in the dental chair. He’s smiling ear-to-ear though he’s missing several bottom teeth. It’s his second appointment to have dentures fitted, the last time he had some placed on his top jaw. 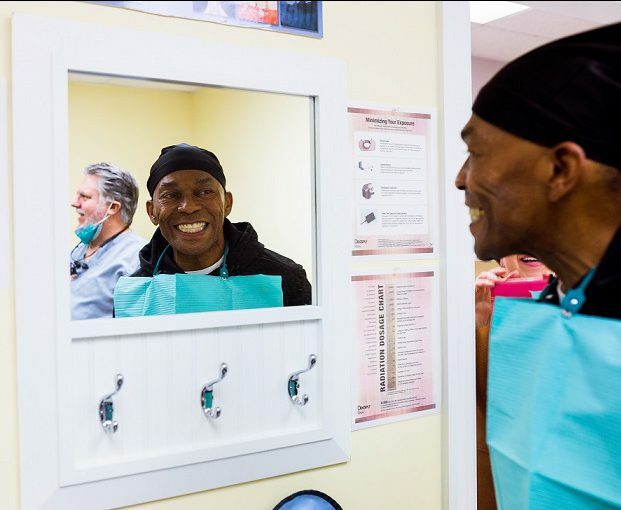 Mr. Jones’ dentures are made possible through the “Donated Dental Services” program at the Virginia Dental Association Foundation – a JRF grantee. He does a few odd jobs for people with his truck while volunteering to bring food from the food pantries to people who can’t leave their home. But that couldn’t begin to cover the cost of his dental needs. One day, Mr. Jones read an article about Virginia Dental Association Foundation (VDAF). He contacted them and was given a case manager, Barbara Rollins. She sent him the application and worked with him to get all the documentation together. 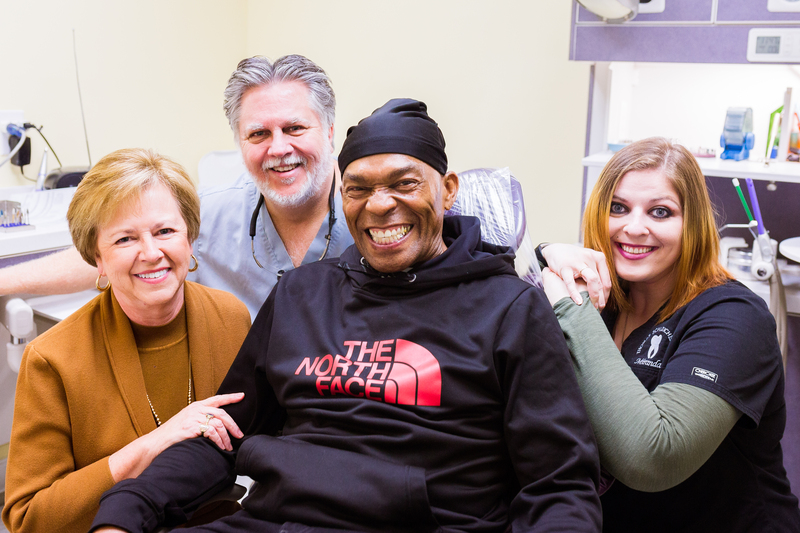 Left to right: Barbara Rollins with VDAF, Dr. Thomas Schleicher, patient Reggie Jones, and Dental Assistant Miranda Craft. With the support of John Randolph Foundation, VDAF connected Mr. Jones with. Dr. Thomas Schleicher, DDS. They were able to remove the gold, clean out all the decay, and replace his teeth with partial, porcelain dentures. 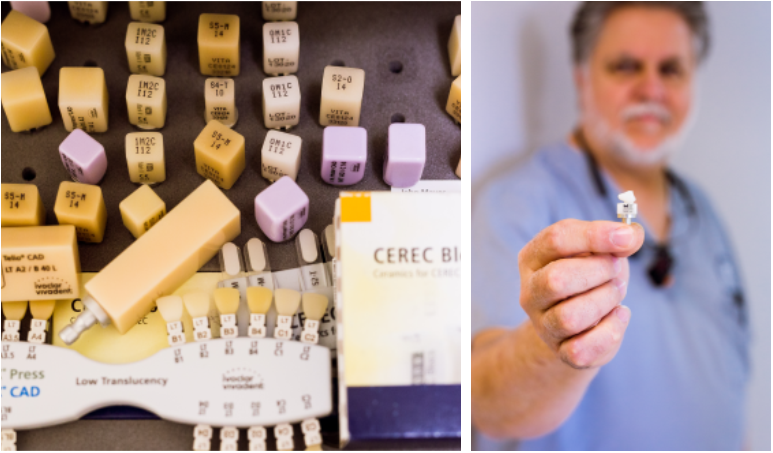 Moving down the hallway, I walk into a back room of Dr. Schleicher’s office and watch two dental assistants put a small porcelain block into a cylindrical machine. The machine lets out an electronic hum and goes to work cutting a denture, perfectly sized, for Mr. Jones. Dr. Schleicher uses CEREC technology to give patients custom-made dental restoration. This is one of my favorite things about Virginia Dental Association Foundation, they are getting their beneficiaries really excellent care. 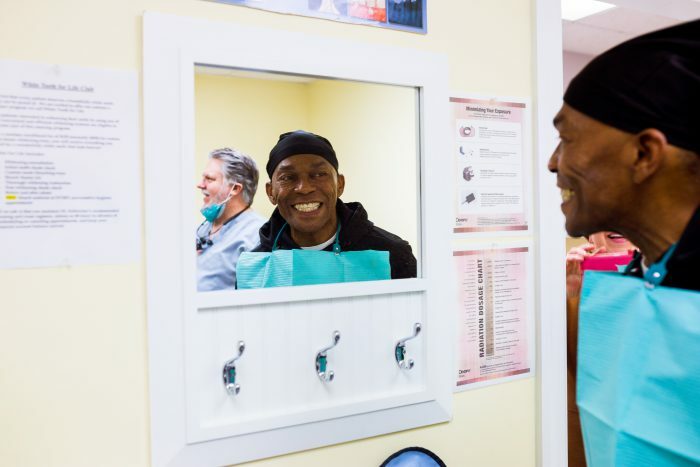 They go above and beyond to make sure the patients are truly healthy, which means they can go on to serve and better their communities for years to come.